Hey everyone! Today I'm going to share with you how I made this ornament cupcake wreath. I was searching for Christmas theme cupcake inspiration on Pinterest and kept seeing lots of lovely ornament cupcakes made of fondant. And then I decided I wanted to make my cupcake ornaments look like one of those beautiful glass ornament wreaths you see hanging on doors. 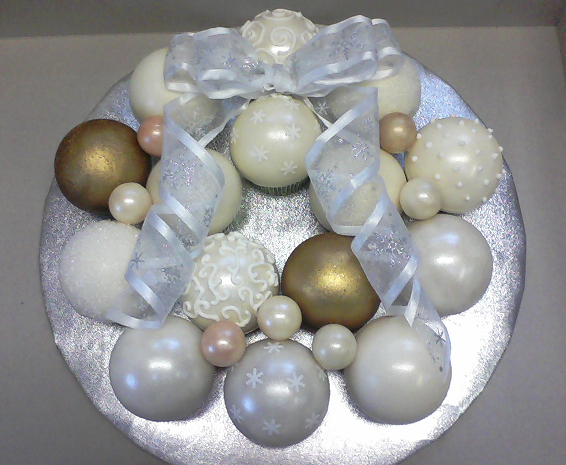 Well, I just love the look of shiny glass ornament wreathes and didn't think fondant would give the realistic fragile, elegant glassy appearance I was going for. So, after some brainstorming I came up with the idea to use white chocolate, and it worked perfectly! 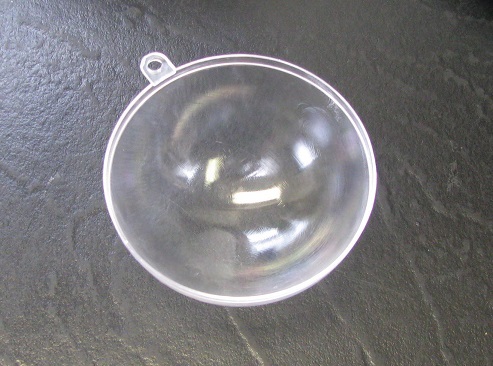 4) Several clear acrylic snap-together ornaments (I purchased mine from Michael's for less than $1 each). Make sure they are close to the size of your cupcakes. 10) Edible colors and decorations of your choice. Here is what I used in the photo above: Royal icing for dots and swirl designs, and also for "gluing" ribbon in place; Wilton luster dusts in pearl, silver and bronze; clear sanding sugar; and gold dust in "Spanish Gold" by CK Products. 12) Royal Icing for Outlining recipe for decorations, optional. Begin by separating the acrylic ornament halves and washing them well in warm soapy water. Dry them well and set them open side up, ready for filling. 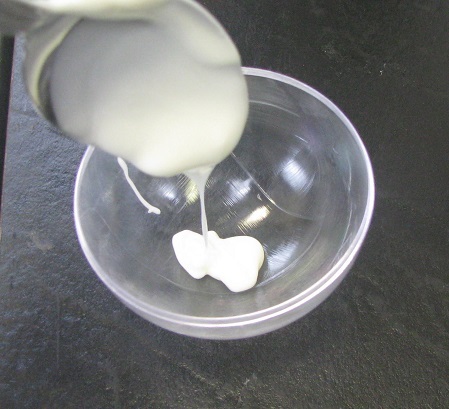 Melt the white chocolate according to package directions and drizzle a small amount into one ornament half. Using the back of a spoon, spread out the melted chocolate so that the entire inside of the ornament half is covered. Set ornament aside to allow chocolate to cool and harden. Repeat this process with the remaining ornament halves. Once the chocolate has cooled and hardened, apply a second layer of melted chocolate to the ornament halves. The chocolate likes to drip down into the center of the ornament leaving the edges a bit thin. 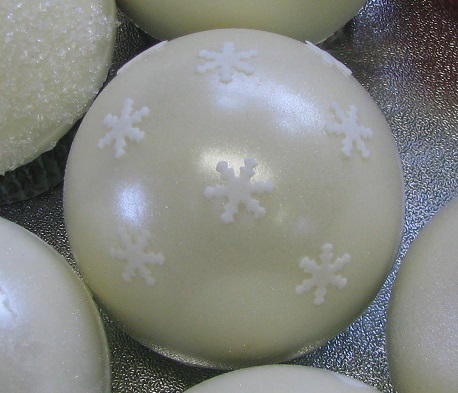 Ensure a thick enough coating of chocolate is on the edges of the ornaments to keep them sturdy. 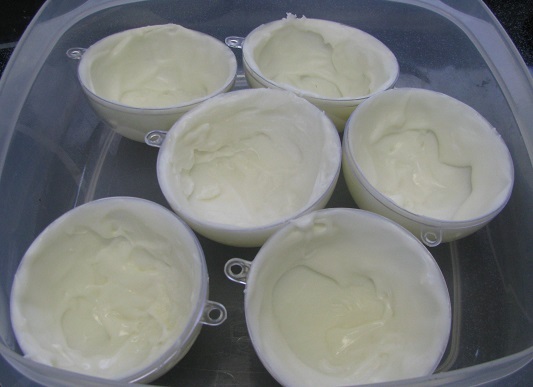 Set aside and allow them to cool completely and harden at room temperature. Once the chocolate has cooled and hardened, gently remove the chocolate by taking your index finger and thumb and lightly press on opposite sides of the edge of the ornament to release the chocolate. Do this around the entire edge of the ornament until the chocolate slips out from the mold. This part takes a lot of patience! 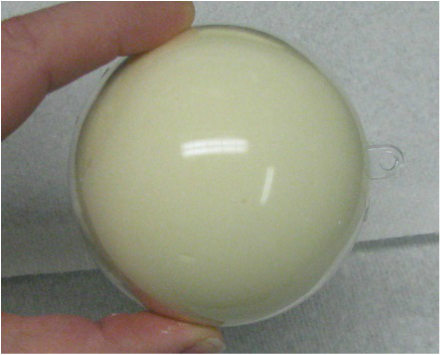 Some molded chocolate ornaments may crack. If they do, just melt the pieces and reuse them. 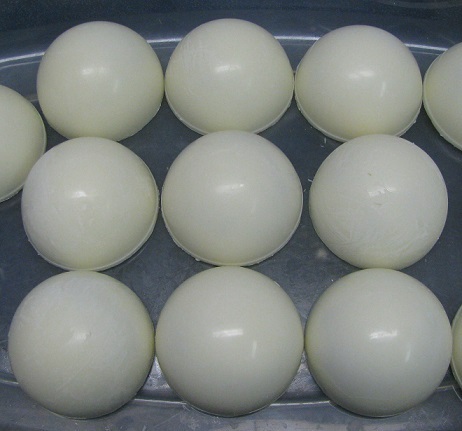 Once all of the chocolate decorations have been removed from the molds, they are ready for decorating. If you're not ready to decorate right away and you'd like to store them for later decorating, place them in an airtight container and refrigerate them. Next, frost your cupcakes. I'm using the Very Vanilla Frosting Recipe found in the recipes section, and a pastry bag fitted with a Wilton 1M frosting tip. Place five cupcakes that will be the center of the wreath in place on the cake base. Line them up to ensure they are centered. Now it's time to "glue" them into place. Using a little buttercream, pipe a small amount onto the underside of the cupcake and set the cupcake back in its place on the cake base. The buttercream will keep the cupcakes from sliding around. Once all of the ornaments have been glued in place, it's time to decorate the white chocolate ornament decorations. 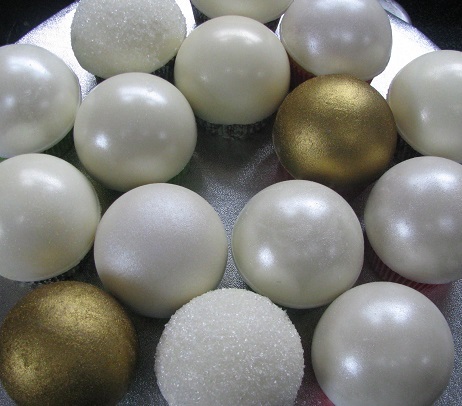 To get a light delicate sheen, dust the luster dusts on dry chocolate decorations. 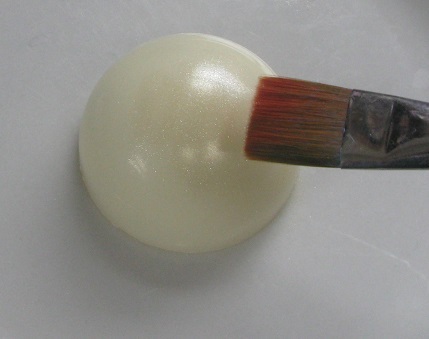 To get a richer coating, first rub shortening over the entire surface of the ornament. Then generously dust ornament with good quality luster dust. The dust used in this photo is CK dust in Spanish Gold. 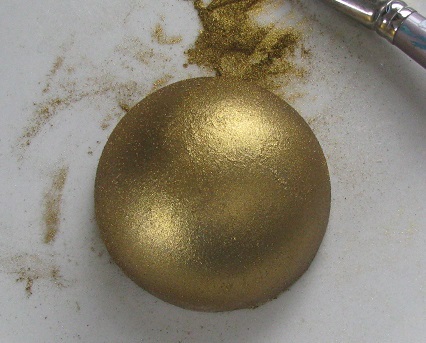 I tried this with Wilton luster dust in gold and it looked like doo doo. Ha ha! But Wilton luster dust in Pearl looked lovely using the shortening method! Also, if you'd like to use sanding sugar you'll need to coat the chocolate in shortening (or light corn syrup may work as well). Now place all of the dusted chocolate toppers on the frosted cupcakes. I wanted to give some of the white ornaments some little snowflake decorations to make them stand out. 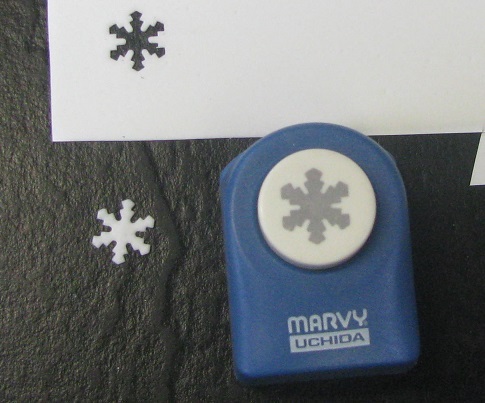 I didn't feel like piping tons of snowflakes by hand, so I used a paper snowflake punch and I found an extra sugar sheet (the kind for edible image printers) and tried punching out some edible snowflakes, and it worked!! Yay!!! Isn't that lovely?!?! I attached them to the ornament by dabbing a tiny bit of water onto the back of the snowflake and quickly placed the snowflake onto the chocolate ornament. Water dissolves sugar sheets fast, so you'll need move quickly. And lastly, add the bow by gluing it in place with a little royal icing or a dab of buttercream. Pipe on designs with royal icing, if using. And then fill in the empty spots with white chocolate truffles dusted with luster dusts. Hope you have enjoyed this tutorial! God bless!